Improvised Rope Rescue encompasses a skill set that becomes necessary when a leader or second falls and is injured, or when a second is unable to climb to a top anchor. Consolidate the building blocks of improvised rope rescue so that a climbing party is able to execute self rescue in more complex situations, like traverses and leader falls beyond half the rope. Confident using the “block and tackle” to escape from an irreversible system. Confident setting up a direct haul system and adding mechanical advantage. Confident lowering with a back-up. Confident ascending and traversing the rope with double prusiks or a prusik and belay device. Confident setting up a counter balance rappel to rescue a victim below an anchor. 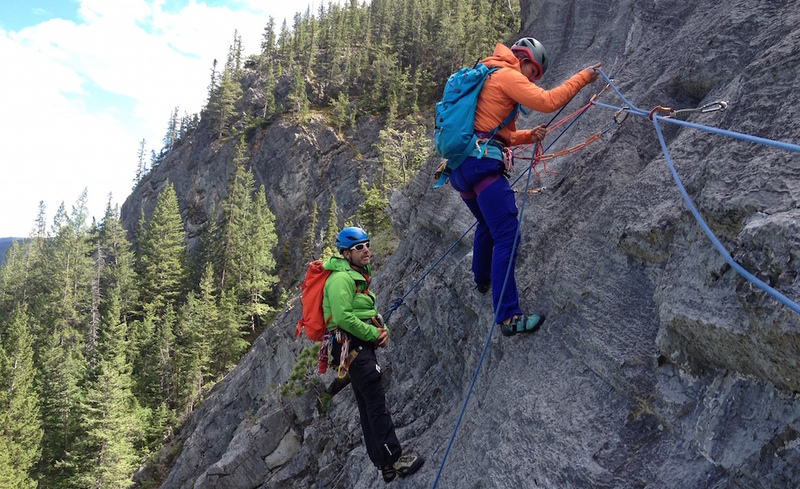 Confident setting up a tandem rappel. Perform a series of rescue scenarios while climbing, including traverses. Confident tying the following hitches: Clove, Prusik, Italian. Confident tying off a belay device or an Italian hitch with the slippery overhand knot.